Since the inception of the internet, political parties and their members have made use of this venue for promoting their campaigns. The presidential elections have not been immune to this trend, and we are witnessing history in the making with the current one. Although media has long been utilized to promote and disseminate information, the internet is one arena that has the capability to reach millions of people instantaneously. Social networking and mobile applications have allowed candidates to connect to voters in a more direct and personal way, and it seems as if there are no signs of this new found method to be slowing down. The 2012 election is nearing ever sooner, and all eyes are now on Obama and Romney. How technology is being used by these party leaders and what are they doing to influence their voters is an important issue to consider, as it may help us understand what the future holds for technology and politics. 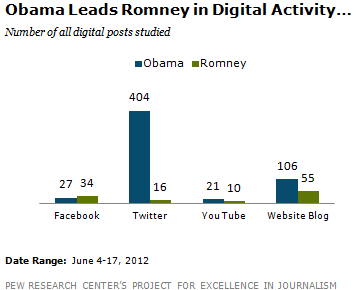 It is no surprise that Obama is leading the way in using technology as a tool for his campaign. In contrast to Romney, the democratic candidate has shown to be much more involved in this realm. Thinking back to the presidential election of 2008 rings similar bells, as many believe Obama’s use of the famous social networking websites Facebook and Twitter helped him gain a valuable lead over McCain. The goal of connecting and ultimately mobilizing the mass of young people throughout the nation has always been a goal of Obama’s, and via this method and an increasing number today, he has proved to be quite successful. Coined the “tech president” due to his far greater use of technology in contrast to any other before him, appears to be worth more than simply a title. 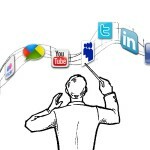 The current electoral year has witnessed his rampant use of Twitter and mobile applications. As these images demonstrate, Romney may be working to hold his own from a social media standpoint, but it is Obama who has won this race. How effective these methods will be come November 6 is another story, but it has millions of us wondering. In addition, it should be noted that while Obama is busy writing up Twitter tweets and Facebook posts, he shares his rival’s tendency to not actively engage the purpose of these social media tools. Most of the contact has been a one-way street, which may or may not have a strong influence on either candidate’s chances. At the end of the day, the question worth pondering is whether this social media craze means anything. While we have certainly seen an increased involvement among the younger crowd, which is undoubtedly a very influential voting bloc, it is still up in the air as to how much of an effect technology will have. 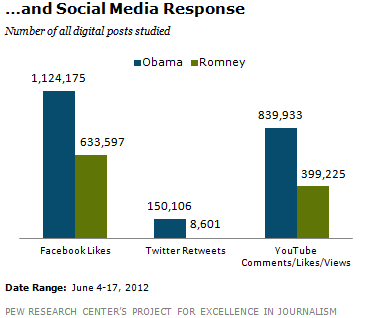 Is Obama going to win the election simply because his Facebook page has more fans? A glance at the current polls indicates this does not seem to be the case. Among the nation’s registered voters, the candidates are almost tied. Thus, although Romney has had a made a minimal amount of effort to influence his voters via the internet, he is commanding an equal footing. A more important point to consider is the long-term potential that technology holds. It is likely that this upward trend will continue, as social media outlets make for connecting to voters much more easily and effective. Ultimately, however, it appears that these channels are simply that, a means for transmitting messages. It is the message that matters. The internet is one way of getting the message across, but it alone cannot determine who will become our nation’s next president.